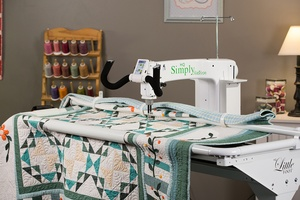 This small longarm has built-in stitch regulation. Learn how to load your quilt on the frame, thread the machine, wind and load a bobbin, establish good tension, bring up the bobbin thread, anchor and tie off threads, and do a little stitching. No supplies are needed to take this class. You may wish to bring note-taking materials.